Well I know I have been lazy with this blog but there is a reason for this. Well a few reasons. 4. I have started writing up the patterns for Raconteur. 5. I have started another blog just to do with Raconteur. So there you have it. there are many other excuses but I think the biggest one is time or lack thereof. If you would like to see what I have been doing blogwise check out my other site by clicking the link to the side or just here. When I put it like that I am not sure when , or sometimes if, I will ever finish this. At this stage it is still fun.. which explains why it is that I am still wide awake at this unearthly hour, almost 1am. In this photo you can see how I filled out the edges along the top. I had made those stripy sections ages ago for a lone star quilt... that's another story. 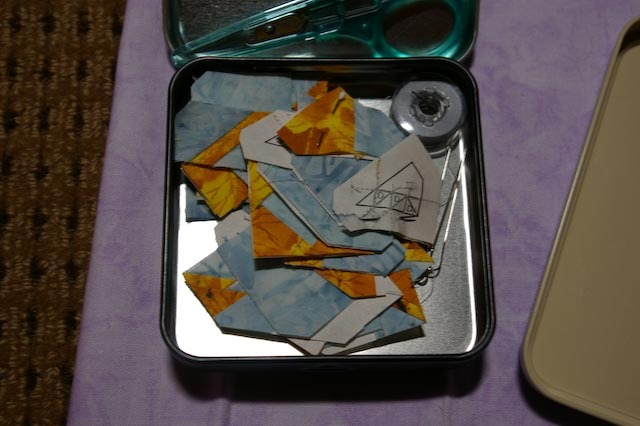 Anyway when I had finished all of the collections I didn't have enough time or ideas to make small filler blocks and then remembered I had these leftovers. As you can see they are just perfect . Well better hit the sack. Kathy Brown recently emailed this to an online group to which I am a member and I thought it was worth republishing. Read and enjoy. IC (otherwise known as irate customer): Who? LPD: This is The Teacher's Pet, can I help you? IC: yes you can (angrily). I got this damn pattern at a quilt shop and it's all wrong. Why did you write something that is not right? LPD: (holding the temper in check) Can you tell me which pattern you have? IC: I don't know. The lady said it was the easiest pattern she's ever done and she was wrong too. LPD: I'm sorry but I cant help you if you cant tell me which pattern you have. IC: It says Teacher's Pet. LPD: Yes ma'am, but that's my pattern company. Each pattern that I produce has a name. Can you tell me the name of the pattern? It will be at the top of the directions. IC: Well hold on (aggravated) Here it is. It's Take 5. LPD: OK now we're getting somewhere. Can you tell me where you are having a problem? IC: Well if I knew that I wouldn't have called you now, would I? LPD: (temper still in check, but getting strained) Ma'am, if you can't tell me where you are having a problem, then I suggest you take the pattern back to the quilt shop where you purchased it and ask them to help you. LPD: (light bulb going off) Yes, you did buy the pattern from a quilt shop, didn't you? IC: I would never have bought a pattern so incomplete as this one. No I didn't buy it. A lady that was buying fabric in the quilt shop - she gave it to me. She said the pattern was easy. And it's not. I keep flipping through these pages and nothing makes sense. LPD: (light bulb flashing furiously) So you have multiple pages of directions, and they do not make sense? IC: That's what I said. Are you hard of hearing too? Yes - I HAVE THREE PAGES. LPD: (more than a little testy now, and counting to 10). Ma'am, what you have is a pattern that has been illegally copied and distributed, and you have not even been given all of the instructions. That is why nothing makes sense to you. IC: (in a huff) Well how do YOU know it's been copied? YOU don't even know this person that gave me the pattern. How can you accuse her? LPD: Because the original pattern that I have printed is formatted on 17"x22" paper, front and back. NOT individual 8 1/2" x 11" sheets of single sided paper. So the pattern has been illegally copied and given to you. IC: (silence - about 10 seconds pass - it feels like an eternity). So what am I supposed to do now? 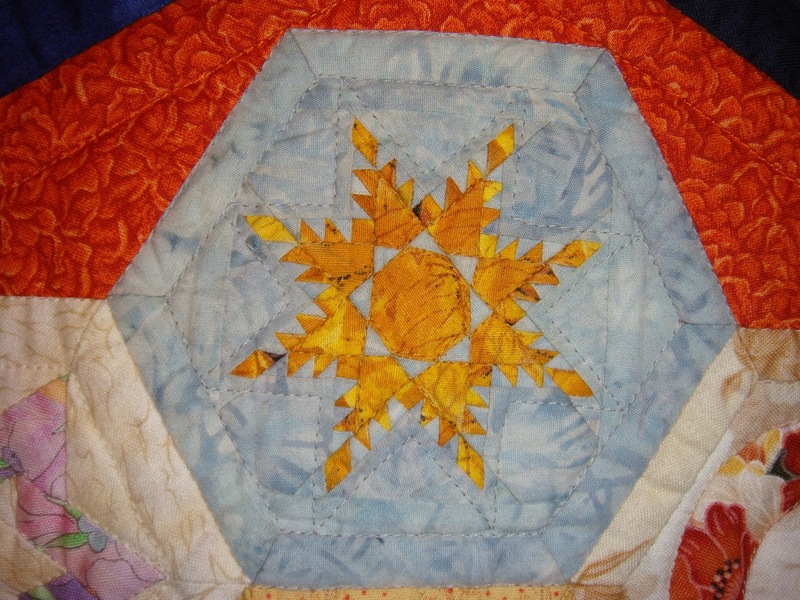 Are you going to give me a free pattern so that I can make this quilt? I bought the fabric and I'm ready to sew. LPD: (who thought she had seen and heard it all after 17 years in the quilt industry) No Ma'am, I'm not. 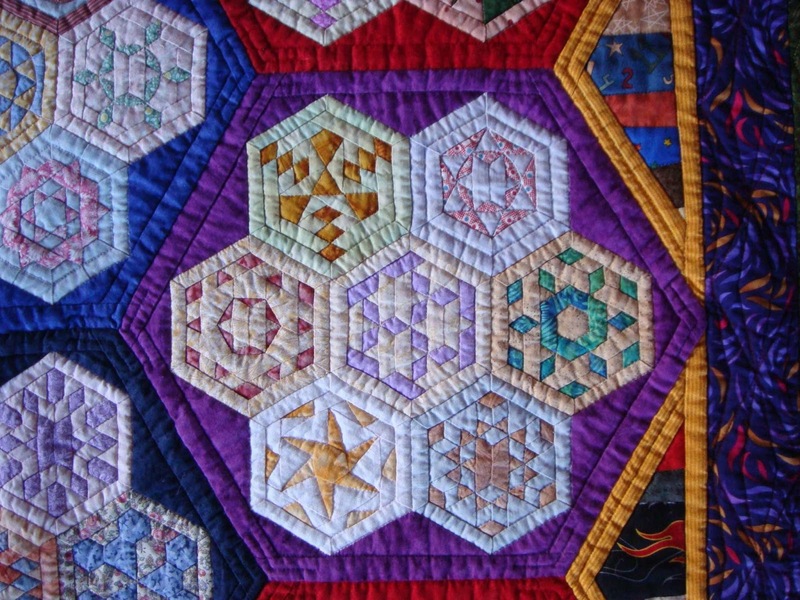 I would suggest you go back to your local quilt shop where you can purchase the pattern. IC: (angry again) Well YOU must think I'm stupid. I'm not going to waste my gas money to drive all the way back to the quilt shop when YOU can just TELL me how to make it. LPD: (incredulous - but with an odd sense of peace slowly flooding over her). No ma'am, I don't THINK you're stupid - but I can ASSURE you that I'm not stupid either. You have a nice day, ma'am. Good bye. As the phone gets placed down, the LPD slowly gets up, pours herself another cup of coffee, grabs the bottle of Advil, and prepares to start her day over again. 1. I am a scrooge economical and didn't want to waste too much fabric trying out my new idea. 2. I am a scrooge loathe to waste and wanted to use as much of the piece of paper as I could. Six hexagons fitted comfortably onto an A4 sheet of paper. 3. I wanted a portable project. 4. The tin which I was given at the Sydney Scquilters retreat was only small and so the blocks couldn't be too big if they were going to fit. 5. I thought my first sample was so cute I decided to keep all of the blocks that size. 6. I was only going to make a few blocks for a wall hanging for the Sydney Quilt Show. The next question was then why did I make such a large quilt. 1. One of my first few blocks had only seven pieces and I was told that they were too big to be really classed as miniatures so I decided to make a lap quilt. 2. After making a few, well ok after making many, I decided that there was no way either of my boys would want a quilt like this so I may as well make it a usable size so queen size it may as well be. 3. 300+ blocks later I calculated that I had made too many blocks for a queen sized quilt so may as well make it for our own bed. We have a king size bed. Here is a photo of one of the blocks which I decided to machine piece. Doesn't that look cute? If you look carefully at the autumn coloured piece of fabric near the bobbin you will see a pin .. this is a clover applique pin which is only tiny. Also looking carefully you can see on the foundation paper the markings for three feathers.... they are also very cute. 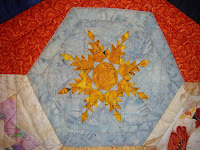 And here you can see the finished block... a feathered star. I couldn't resist trying it after seeing some unbelievable feathered stars made by Jane Gibson a couple of years ago at the Jamberoo retreat. If you blow up the picture until the outer edge of the hexagon, the outer edge of the border around the hexagon that is, is 2 1/4in you will be able to see the block full size. For anyone curious about the numbers this block has 138 pieces. It should have only been 134 but I had to add four extra strips on the edges as I made it a tiny bit too small. btw there is another block with more pieces...it's cute too.